Cape Town - World No 1 Test bowler, Dale Steyn believes the role of the senior players has been a key factor in giving the younger players a comfortable introduction into the Proteas squad. Steyn, an established member in the squad with 62 Test caps, feels the new players are benefiting from the professional and harmonious team environment within the setup. Recent indications of this has been the success of Rory Kleinveldt, Faf du Plessis and Dean Elgar, who have excelled on their debut runs in International cricket. “Those are the kind of things that the senior players try to lead in their preparation and everything else,” Steyn said about the senior leadership.“When guys fall into this team we want to show them that there is a difference between domestic and International cricket, not just the way it is played but in the way that you train as well, including the whole vibe that comes with playing in this team. Steyn claimed his 19th five-for in New Zealand’s first innings, which has put him only behind Allan Donald for South Africa and 20th on the all time list. He was asked which of the 19 landmarks were his most memorable, and named two achieved in unresponsive testing conditions. 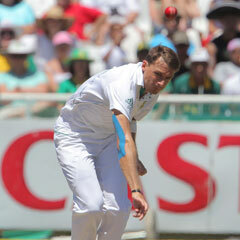 “19, there are so many,” Steyn joked. “I remember there was one in the West Indies where I picked up five wicket in the first Test coming around the wicket. The ball was reversing, there were a few left-handed batsmen and the guys left the ball which gave me wickets. When I left the field I thought to myself ‘i couldn’t have bowled better’, it just worked out perfectly. The Proteas will be banking on the second new ball which is due in the 13 overs to take the last remaining six wickets, and look set for victory as there is still plenty of time left in the match.